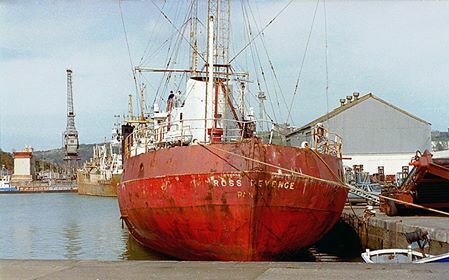 Following the stranding on the Goodwin Sands the Ross Revenge was brought into the Eastern Docks in the Port of Dover, berthed in the Granville Docks area ... and promptly arrested. In the days that followed DTI surveyors put together a list of defects and a Detention Order was issued. 1.1 - Watertight integrity of the forward engine room bulkhead to be rectified. 1.2 - Railings and catwalks to be repaired or replaced as necessary. 1.3 - Hatchway to Transmitter Room to be repaired and made watertight. Temporary plastic ventilator on hatch to be replaced with a permanent steel structure. 1.4 - Doors and openings on the weather decks to be made watertight and securing dogs to be made operable. 1.5 - Closing devices on ventilators and air pipes to be made watertight and operable. 1.6 - Manhole covers that have been removed from tanks to be replaced and securing studs replaced as necessary. 1.7 - Freeing ports to be made operable. 1.8 - Watertight integrity of the focsle to be rectified. 1.9 - Vessel to be dry docked to inspect the external hull. All ships side valves should be opened up for inspection. 1.2.1 - Main propulsion engine to be made operable and provide ahead and astern power. 1.2.2 - Auxillary machinery to be made operable. b) - Fuel System including Fuel Oil remote stops for pumps and quick closing. 1.2.4 - Steeing gear to be repaired or renewed. 1.2.5 - Rudder to be inspected in dry dock. 1.2.6 - Two anchors including cable chain the same as that previously fitted to be provided. 1.2.7 - Anchor Windlass including capstans / winches to be made operable. 1.3.1 - One rescue boat with launching arrangements to be provided. 1.3.2 - Inflatable life rafts to be serviced and hydrostatic release fitted. 1.3.3 - Pyrotechnics to be replaced. 1.3.4 - Lifejackets for crew to be provided. 1.3.5 - EPIRB's to be provided. 1.3.6 - Embarkation arrangements for survival craft to be provided. 1.3.7 - Fixed CO2 system for engine room to be made operable. 1.3.8 - Fire integrity of forward engine room bulkhead to be rectified. 1.3.9 - Fire main aft to be replaced and be system tested. Fire hydrants to be provided in Transmitter room and auxillary machinery space forward. 1.3.10 - Fire dampers to be reparied or renewed and made operable. 1.4.1 - Adequate manning, including certificated officers, should be provided for the intended service of the vessel. 1 - No Cargo-Ship Safety Equipment Certificate. 2 - No Cargo-Ship Safety Construction Certificate. 3 - No Cargo-Ship Safety Radio Certificqte. 4 - No Load Line Certificate. 5 - No I.O.P.P Certifcate. 6 - Crew members have no maritime qualifications. 7.1 - Inadequate ventilation - no heating. 7.2 - No sanitary or shower facilities. 7.4 - No medical scale onboard appropriate to the vessel. 7.5 - Provision of furnishing inadequate. 8.1 - To be covered by separate report with assistance from Port Health Authority. 9.4 - Access to and from working spaces blocked. 10.1 - No davit launched rescue boat or lifeboat. 10.2 - Inflatable liferaft servicing out of date. 10.3 - No float-free arrangements for liferaft. 10.4 - Securing strop perished for liferaft. 10.5 - All pyrotechnics out of date. 10.6 - Lifebuoys - cordage missing and perished, no attachments, no reflective tape. 10.7 - No lifejackets for crew onboard. 10.8 - No immersion suits onboard or thermal protective aids. 10.9 - No portable radios or radio telegraph for survival craft. 10.10 - No EPIRB's onboard. 10.11 - No general emergency alarm. 10.12 - No embarkation arrangements for survival craft. 10.13 - No line throwing appliance onboard. 10.14 - No record of inspection / maintenance of LSA. a) - The integrity of the fwd engine bulkhead has been damaged. b) - The bulkhead separating the fwd auxillary machinery space from the transmission room should be made of steel. c) - All access doors to the machinery space should be of steel and self closing type. 11.2 - Fire fighting equipment to be readily availble. a) - Main Machinery Space - C02 Bottles Empty, System to be Serviced. a) - All hydrants and hoses to be overhauled. b) - All extinguishers to be overhauled. c) - Fire hydrants to be provided in all spaces, with associated hoses. 11.5 - 2 Firemans Outfits to be provided. 11.6 - Forward section of fire main to be replaced. 11.7 - Fire Main to be pressure tested and fire pump operated. 11.8 - Emergency fire pump to be provided with separate suction and power supply outside the main machinery space. 11.9 - All fire dampers, valves, quick closing devices, remote control arrangements to be made operable. 11.10 - No international shore connection. 11.11 - All gas cylinders on deck to be contained and secured within a steel compartment. 11.12 - All piping to gas appliances to be of steel or equivalent material and be adequatley clamped. 11.13 - Petrol driven generator to be removed from vessel with petrol containers. 11.14 - Heating of Mess Room using gas bottle and appliances is unacceptable. 12.1 - All machinery to be adequatley guarded. 12.2 - Electrical wiring to be secured in steel trays and electrical fittings to be secured. 12.3 - Port and S'Board walkways adjacent to trawl winches to be renewed. 12.4 - Walkway between trawl winch and accomodation to be renewed. 12.5 - Starboard stairway to Bridge to be of steel. 12.6 - Ladder to focsle head to secure and hand rails made good. 12.7 - Accommodation, machinery spaces and other accessible spaces to be cleared of all unnecessary equipment. 13.1 - No exit signs, escape signs, muster signs, open/close signs on fire dampers. 13.3 - No muster lists or record of drills. 13.4 - Steering gear completely destroyed. 13.5 - No evidence of existence of rudder. 13.6 - Integrity of hull in various places to be secured - see load line items. 13.7 - All ballast and fuel tanks to be emptied and opened for inspection. 13.8 - Emergency source of electrical power to be confirmed. 13.9 - Electrical arrangements including wiring to conform fully with relevant regulations. 13.10 - No pilot ladder onboard. 13.11 - No accommodation ladder / gangway oboard. 13.12 - 2 means of escape from all spaces to be provided. 14.1 - No General Alarm. 14.2 - No Fire Alarm. 14.3 - Machinery and Boiler alarms to prove. 15.1 - No freeboard marks on side of vessel - no stability information onboard. 15.2 - Extensive corrosion to railings and catwalks. Missing railings to be renewed. 15.3 - Hatchway to transmitter room to be repaired and made watertight. 15.4 - Vent on hatch to be made of steel. 15.5 - Means of closing all vents from transmitter room and forward auxillary machinery space to be provided. 15.6 - All ports and deadlights and associated fittings to be made operable. Port glasses to be renewed where necessary. 15.7 - All doors and openings to be re-joined and made watertight. All securing fittings and bolts to be made operable. 15.8 - All closing devices on ventilators to be made operable - vent trunking to be repaired where necessary. 15.9 - All closing devices on air pipes to be made operable - air pipes to be replaced where missing and repaired as required. 15.10 - Openings in engine room casing to be made operable. 15.11 - Funnel trap to be replaced. Funnel structure badly coroded - repair as required. 15.12 - Engine room skylight and vent to make watertight. 15.13 - Water tight integrity of the forward engine room bulkhead has been breached. 15.14 - Manholes to be replaced on all double bottom tanks - holding studs to be replaced. 15.16 - All freeing ports to be made operable. 15.17 - Focsle head watertight integrity breached. 16.1 - No anchors and cables onboard. 16.2 - Windlass to be made operable and capstans / winches. 16.3 - Inadequate lighting at mooring stations. 17.1 - Main propulsion engine to be made operable and provide ahead and astern power - ancillary machinery and system to be tested. 17.2 - All engine room oily bilge water to be pumped ashore and oil removed from bilge. 17.3 - All auxillary engines to be made operable and ancillary systems tested. 17.4 - Bilge pumping stations to be pressure tested to 2 bar and be system tested. 17.5 - Ballast, fuel and fresh water pumping and pipework arrangements to be tested. 17.6 - All machinery to be guarded / fenced to prevent injury. 17.7 - Engine Room workshop to be cleaned up. 17.8 - Fuel oil quick closing valves. Remote stops for pumps etc to be tested. 17.9 - Acceptable method of ascertaining level of oil in tank to be provided. 18.1 - No approval of any navigational equipment onboard. 18.2 - No operational radar. 18.3 - Magnetic compass to be adjusted. 18.4 - Gyro compass inoperative. 18.5 - No means for taking 360 degree bearings. 18.6 - Navigation lights inoperable. 18.7 - No shapes onboard. 18.8 - Ships whistle inoperative. 18.9 - Signalling lantern inoperative. 18.10 - Charts and publications out of date. 18.11 - Echo sounder inoperative. 18.12 - Ships log inoperative. 18.13 - Rudder angle indicator and telemotor system not working. 19.2 - No operators licences onboard. 19.3 - No EPIRB onboard. 19.4 - No 2 way radios for survival craft oboard. 19.5 - No radio log. 20.1 - No oil record book oboard. 20.2 - Oily water separator must comply with Reg 16 of Annex Maritime Convention. 20.3 - Sludge tank to be provided. 20.4 - No standard discharge connection.